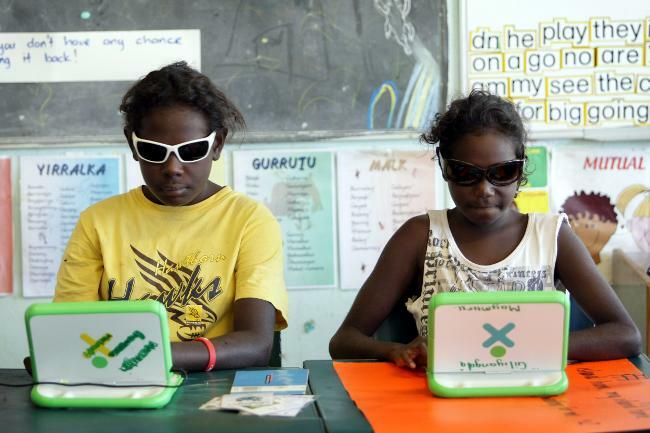 From OLPC Australia, Sridhar Dhanapalan reports on the latest deployment in Yirkalla — a follow-up to earlier work done [two months ago] in 3 comunities in East Arnhem Land. This is the first proper deployment of 1.XO-5’s anywhere in the world! Sridhar’s report is worth a read – though I’m looking forward to hearing more about how the 1.5’s are being used in class. (Sridhar: I’d love to have a guest post from you with more about how the laptops are being used, and how the initial handout went) Over the weekend, there was a nice short writeup of the progress in the deployment there by the Daily Telegraph. They took some gorgeous photographs while they were visiting the schools. And here’s a lovely video from the same part of the country. And I just saw the updated map of all of the major and minor deployments in Australia — aside from the icon selection, this map is fantastic.